Tickets for Storm’s upcoming game against the Guildford Flames can be ordered online HERE, or by calling the Box Office on 0161 926 8782, or in person at the box office. Face-off is 19:30, 16th January. Let’s pack the rink, as Storm look to defend the Patton Conference. Your Go Goodwins Manchester Storm skated off the ice last week celebrating a four point weekend. On Saturday 12th the team beat The Nottingham Panthers 3-0 away in Nottingham, claiming two points on the road. Sunday’s game on home ice was an impressive 11 goal game, Storm beating Fife Flyers 7-4. Tonight sees a mid-week Patton Conference clash against visitors, Guildford Flames. Commentator Aaron Murphy and the FreeSports media crew will be in the Storm Shelter tonight, as this EIHL game is to be televised via FreeSports for the first time this season! 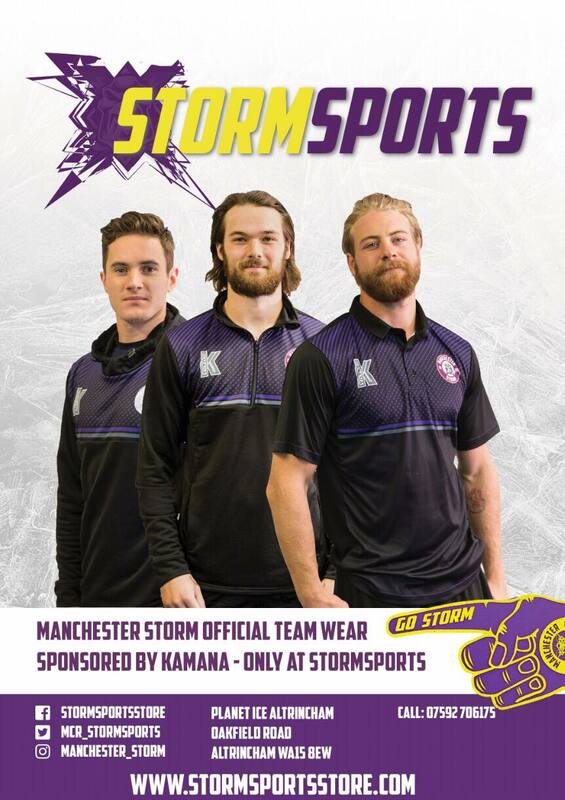 We want to see you all wear the colours and turn up at the Storm Shelter to support the Storm boys this evening. Let’s be loud and proud and help give the recognition that ice hockey in the UK deserves. Guildford had two high scoring games against Patton Conference rivals, Coventry Blaze last weekend. Having lost one in overtime and won one in penalty shootout, they will be looking to up their game this week. Last time the two teams faced each other in Altrincham was back in November. It was Mike Hammond’s, game winning goal that secured the 3-2 win in the final five minutes of regular time – a moment none of us will be forgetting for a while. Flames are currently in 6th place in the EIHL table. Only three points lie between the Storm and Flames in the EIHL. You can be sure to expect plenty of competition between the two teams this evening as Storm look to continue their point streak on home ice. Following this evening’s game, the next home game for Storm falls on Sunday 20th January – 17:30 face-off. It will be another game not to miss, as Storm look to defend the Patton Conference title against Coventry Blaze! The OSC have just announced their next event, Storm Bingo – taking place January 22nd, 7:00PM. Email [email protected] for more information! The supporters club have a few upcoming events; from ladies night to Bowling with the Storm. Go and check their social media out!